Who will nab the top spot at Super Bowl 50? With so many candidates vying for MVP, it is anyone’s guess. Will it be a runaway quarterback, the halftime show, a blow-out team performance or will a commercial steal the show? Perhaps it will be something else altogether? Let’s run the plays. In years past, super bowl commercials have made the game worth watching, especially when the game itself was a letdown. When the only saving grace is a bag of Doritos or a heart-warming doggie adventure, commercials can have just as big an impact on game night. In fact, the ad themselves have a way of picking up the slack after an epic fumble. With host city San Francisco predicting bright skies and warm temps, there’s a chance Old Spice’s “The Man Your Man Could Smell Like” could ride in and save the day. Perhaps it will be the halftime show. It is expected to be an extraordinary performance as Coldplay will be joined by Beyonce on stage. We can look forward to a lot of rocking and popping at Levi’s Stadium. Here’s hoping everyone’s jeans stay up and there are no wardrobe malfunctions. Noteworthy is the fact that 2016 marks a special super bowl celebrating the 50th anniversary of American football. Will the moment create a thrilling game for the record books or will one man stand and deliver? All eyes have been on star QB Cam Newton of the Carolina Panthers, which is the team favored to win. But the chatter has left fans wondering if there is just way too much pressure. We’ll find out soon enough when the game gets underway this Sunday. But for those not sitting in the stands at kickoff, there is always that fifth option: the food! 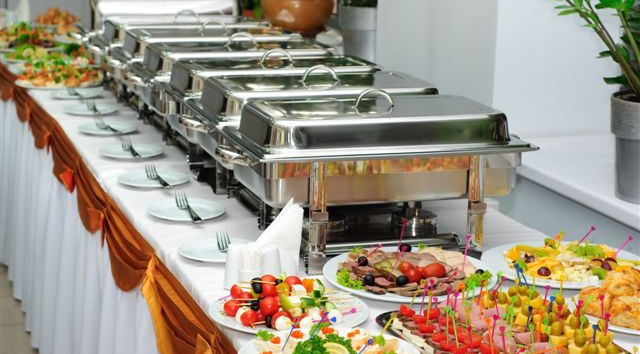 Much like the super bowl, party hosts are relying on the pros to deliver the goods, hiring personal chefs and private caterers to feed big game appetites. But game day has gone gourmet, dishing up more than just pizza and wings. I for one will be leaving it all on the field with a spread that includes Mini Crab Cakes & Mango Sauce, Pan-seared Salmon with Fresh Lemon Drizzle, and fall-off-the-bone Pineapple Teriyaki Short Ribs. And that’s just some of the highlights. No one knows how this will all shake out. And of course there’s bound to be the usual monday morning quarterback post game. But what’s not up for debate? Sitting down to a feast and not lifting a finger except to reach for a scrumptious bite. Touchdown! When it’s all said and done the MVP of your Super Bowl may very well be the food!